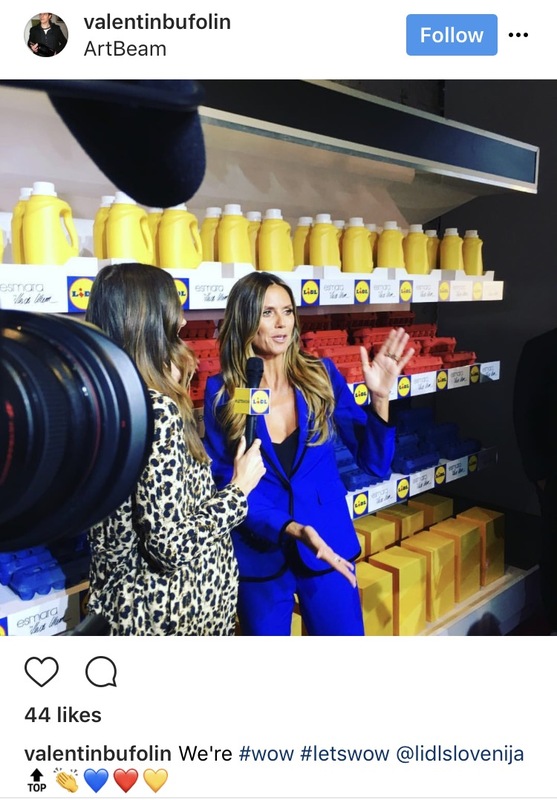 UVLD was thrilled to be invited by 6up Productions and longtime partner Marlyn Productions to design the lighting for the LIDL event as part of New York Fashion Week. LIDL is not (yet) a household name in the United States, but in Europe they are ‘UGE, operating over 10,000 stores across Europe. As part of their welcome expansion to our gentle shores, they are launching their new fashion line, Esmara by Heidi Klum, as part of Fashion Week. The team transformed ArtBeam, a westside performance space, into a stylized LIDL store, complete with awesome props and an LED ceiling to evoke the not-so-awesome fluorescent lighting tradionally found in retail spaces. The space also featured a double conveyor belt runway which onsite designer Gregory Cohen was told he could not use as a treadmill. Production Electrician Steven Leaf and the team from Worldstage handled the load in and the gear. Michael Kurtz was the tecnical director with Samantha Vazquez as executive producer. The LED ceiling was never left to just be boring flourecent lights as we drove them with PRG Mbox media servers to keep them animated.